alaTest has collected and analyzed 62 reviews of Panasonic DVD e.cam VDR-D50E-S. The average rating for this product is 3.9/5, compared to an average rating of 4.0/5 for other Camcorders for all reviews. People really like the image quality and zoom. The portability and price also get good opinions, whereas views are divided on the battery. We analyzed user and expert ratings, product age and more factors. 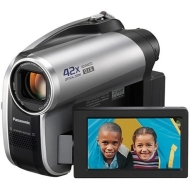 Compared to other Camcorders the Panasonic DVD e.cam VDR-D50E-S is awarded an overall alaScore™ of 77/100 = Good quality. alaTest has collected and analyzed 2 user reviews of Panasonic DVD e.cam VDR-D50E-S from Amazon.co.uk. The average user rating for this product is 4.0/5, compared to an average user rating of 4.0/5 for other Camcorders on Amazon.co.uk. alaTest has collected and analyzed 44 user reviews of Panasonic DVD e.cam VDR-D50E-S from Amazon.com. The average user rating for this product is 4.0/5, compared to an average user rating of 3.9/5 for other Camcorders on Amazon.com. People really like the image quality and zoom. The portability and price are also mentioned favorably. works very well. would like to view video on a PC though. controls are small for big hands person. "Multifuction works great","Simple Controls","Versatile","Great Features"